It can be daunting to do your first triathlon! Being properly prepared improves your confidence and confidence improves your performance. 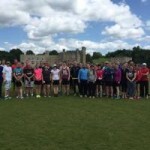 This is why thetrilife.com com is offering Preparation Days for the Leeds Castle Triathlon. In convenient 3 hour sessions our coaches will help you prepare for this event by teaching you new skills and answering all of your questions. These sessions are designed for those athletes taking part in their first triathlon! • Open water swim training – not only invaluable practice in the castle lake but also in a wetsuit. Learn about course sighting, turning and how to deal with a mass start! • Transition skills – what do you do in transition? Learn how to prepare your bike, the best way to layout your kit, how to do things quickly and the rules that you need to know. Our coaches will have you running with your bike like a pro! • And finally – a race day walk through. Get all your questions answered from “what time do I need to be at the venue” to “where is the finish line” and everything in between. Please note that places are limited and will be allocated on a first come, first served basis. One booking form must be completed per entrant. If I’m injured, can I defer my place to next years Training Session? We can swap your booking to 2020 up until the 24th of May 2019. After that your place can only be transferred to someone else or cancelled as we would be unlikely to be able to re-sell the available training session slot at such short notice.